Very Hungry Caterpillar Teether, $8: We got this as a gift and both Weston and I love it. It's small, so it's easy to throw in the diaper bag. It makes noises, so it's entertaining for him, and it's easy for his small hands to grab it. It's also a teether, which he doesn't use yet, but I know he will. This is a great distraction toy at the doctor, or in his car seat. Musical Set, $38: We got this before Weston was born from some dear family friends; they must have known we'd be pushing music on the poor kid! 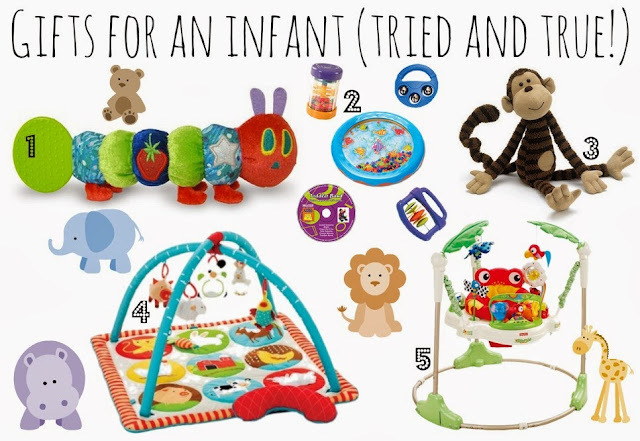 Anyway, we love this set because it's simple musical instruments, and they make it easy for us to wrap his little fingers around the toys and shake shake shake to make music! It also comes with a CD. Great gift. Jellycat Monkey, $24: So, Weston doesn't have this monkey, but he has a VERY similar stuffed blue dog. The story of blue dog is that he flew all the way to Weston from Scotland! My brother's college roommate's mother, in Scotland, got blue dog for Weston long before he was born. I fell in love with Blue Dog, he had such a sweet face! When Weston was born, I would put Blue Dog near him, and he loved the softness of his body, and as he is getting older, he loves grasping his skinny legs and arms. He's the perfect little size for a little boy. Now he snuggles with him! He's in most of our photos of Weston. We love Blue Dog so much that Granna bought Weston two more, all the way from England. We have one at home, one at my mom's house, and one in the diaper bag! Anyway, they don't sell Blue Dog online, but this monkey is the same deal! What a sweet face! Skip Hop Farm Animals Activity Mat, $114: This was a gift from my school, and boy does Weston LOVE it. He could lie under those animals and kick forever. Sometimes when I'm doing dishes/cooking, he will lie in the kitchen and play for a good 45 minutes! It's all cotton and easy to throw in the car. Rain Forest Jumperoo, $94: We just bought this for Weston, as he's very active boy and LOVES to jump! At first he was a little skeptical, but loves this now! We put a book under his feet to jump off of, but he really jumps very well! He also loves to sit and hang out watching Thomas the Tank Engine in it. He was just three months when we started him in it, and it's well worth the money.